At Bayview North Optometry, we specialize in providing comprehensive, personalized eye care in Aurora for the entire family. We are very proud to be serving patients in Newmarket, Aurora, and surrounding communities. We use up-to-date technology and current techniques to provide eye care services in a professional and caring environment. Regular eye exams for children and adults should be seen as an important aspect of caring for your overall health. We recommend annual eye examinations for children under the age of 20 and adults over the age of 65. For healthy adults between the age of 20 and 64, an eye exam every 1 to 2 years is recommended. Patients with diabetes and other health conditions may require an annual eye exam. 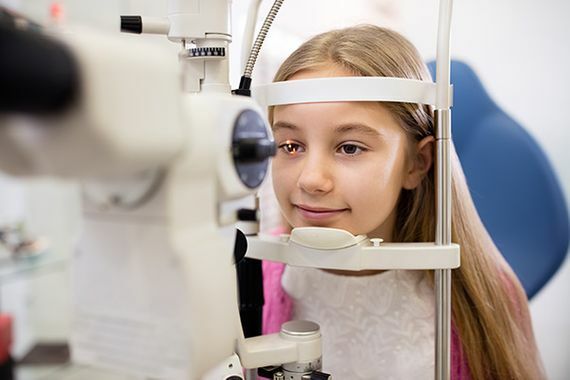 Comprehensive eye exams can detect vision problems and serious eye diseases early, even before you notice any symptoms (eye diseases such as glaucoma and diabetic eye disease may not have any symptoms in the early stages). If detected and treated early, the risk of harm and vision loss from eye disease is greatly reduced. Vision problems in young children often go undetected as children often will not know how to communicate that they are not seeing properly. The first part of your eye exam is a detailed history which includes questions about your vision, whether your eyes bother you in any way, health conditions, medications, allergies, and family history of eye diseases. Your vision will be checked with and without glasses (if you wear glasses) and the eye muscle alignment of your eyes will be assessed. Your depth perception (stereopsis) and colour vision may also be tested. A subjective refraction is performed to determine your current prescription for eyeglasses (and contact lenses, if necessary). The most important part of a comprehensive eye exam is checking the health of the eyes for diseases such as glaucoma, cataracts, macular degeneration and diabetic eye disease. For most adults, this test will be done after drops are instilled in your eyes to dilate your pupils. Because of the pupil dilation, we recommend that you bring your sunglasses for driving (some patients may prefer to bring someone to drive home following the dilating drops). Following your eye exam, the findings will be discussed with you and recommendations may be made based on the results of the tests performed during your eye exam. You will be given a chance to ask any questions you may have about your eyes and findings during your eye examination. We encourage asking questions! If you wear contact lenses - if possible, remove your contact lenses prior to your appointment and wear your eyeglasses. If it is not possible to wear your glasses, no worries! We can provide you with a case and contact lens solution to store your contact lenses while you get your eyes examined. If you take medications - bring a list of your medications - this is important as many medications can have side effects that affect your eyes and vision. Bring your Ontario health card, in case your eye exam is covered by OHIP. Bring your sunglasses - you may have drops that will dilate your pupils as part of your eye exam - this will make your eyes very light sensitive for a few hours after your appointment (let your optometrist know if you prefer not to have your eyes dilated). Humphrey’s Visual Field Analyzer - this device is used for visual field testing (peripheral vision test). This test is important if you have glaucoma, or are a suspect for glaucoma. It may also be a test required for obtaining a valid driver’s license. Digital Retinal Imaging - this is a camera that takes digital photographs of the back of the eye (retina). This test is recommended for most adults for a baseline and every few years following that. It may be recommended more often if you have diabetes or other eye diseases which require regular monitoring. Laser eye surgery consultations and post-operative care - at Bayview North Optometry, we work with highly reputable laser eye surgery clinics such as TLC and the Bochner Eye Institute. If you are interested in laser eye surgery, ask if you are a candidate. At Bayview North Optometry, we strongly believe that children need complete, annual eye examinations. Your child should have a complete eye exam before starting kindergarten and annually throughout the school years to ensure optimal eye health and developmental progress. Don’t hesitate to call to book your child’s eye exam! Ready to schedule your next Eye Exam? Is it time for your annual eye exam? Contact Bayview North Optometry to schedule an appointment today. We’re happy to answer any questions or address any concerns you may have about eye care needs.